Another year, another Bologna Children’s Book Fair. My spring has been marked by the fair for the last three years. Just in case you don’t know about BCBF, it’s the leading professional fair for children’s books in the world, hosted annually in Bologna, Italy. Publishers from all over the world flock to the fair to sell and buy rights of books, and so do Illustrators to promote their books and to meet publishers. Since now I have an agent, I didn’t need to see many publishers so I took more relaxing approach at the fair this year, which is my third time; Less running around and queuing; More lectures/workshops and book browsing (read Book of the Month: April for books I bought during my time in Italy). In this post, I just want to share some of highlights during my time at the fair and in Bologna. If you’re an illustrator and interested in more practical tips, read my BCBF guides from the previous years (2017 and 2018). For being the third timer, I felt the huge venue and programme list less overwhelming and queuing less daunting. I spent most of time just enjoying lectures, workshops and exhibitions. Actually, I still missed some events I wanted to see (masterclasses with Beatrice Alemagna and Rob Biddulph and talk with Lauren Child to make a few). That’s how packed this year’s programme was! I was gutted to miss my friend Iris Samartzi‘s paperbag story workshop too, which other friend told me was great. This year I queued for only handful of publishers. Thanks to the past experience, I was more efficient this time, knowing when to join and leave the queue to avoid disappointment. As always, it’s nice to meet and chat with other illustrators who shared the pain of queuing. Actually, I reunited with an illustrator I met in a queue last year! Isn’t that nice? 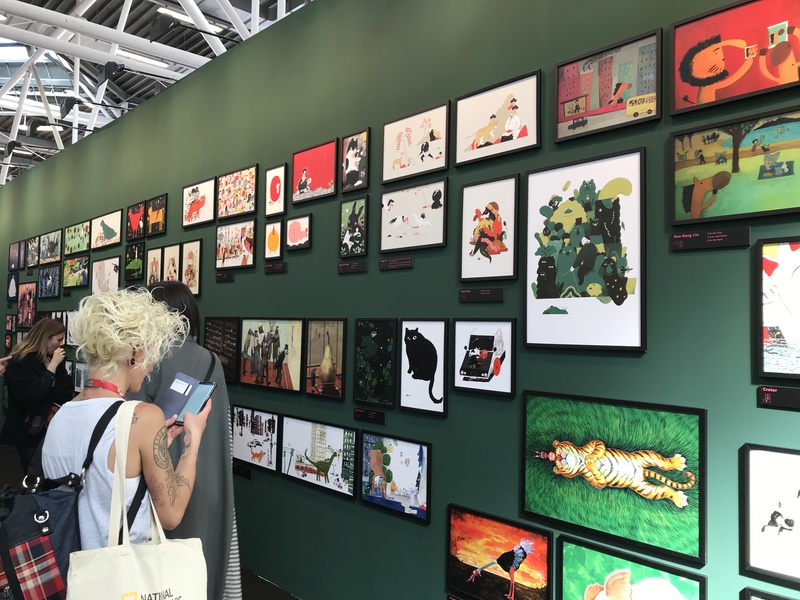 The biggest highlight for me was, without doubt, making my BCBF debut with my first picture book, Avocado Asks (out in April 2020 from Orchard)! It was a fantastic feeling to hold my book at Hachette UK stand in THE fair even though it was just a proof copy! I very much hope this book will the first of many I will publish but I know nothing can’t beat this precious first time. Actually I can’t still believe my book will be published! I wonder (and hope not) if Hachette people noticed me hovering around and peeping into their stand every day to see how well my book doing at the rights meetings. Vessela Nikolova‘s exhibition at Zoo (they do children’s book related exhibitions/events every year during the fair season – do check it out). A super cool risograph exhibition by Marco Brancato and Martoz x Inuit at Galleria B4. As always, I had a fantastic time at the BCBF. It’s definitely one of my favourite events. But what makes it so great was my friends who share the excitement and pain of the fair and the wonderful city. The BCBF has become an annual reunion opportunity among my friends. This year I shared it with these three wonderful ladies. We walked, queued, slept, ate and drunk together for the fantastic 5 days. We agreed Bologna is our favourite city in Italy. Each year it became more familiar to us and now we have some go-to restaurants, bars and shops. But we also discovered new places such as Berberè, an amazing pizzeria, and Banco32, a casual fish restaurant. I also met more new people through my friends and in the queues. Seeing old faces and meeting new faces – it’s the best thing about the BCBF, I think. I would probably go back to Bologna just to eat delicious food with my old and new friends!